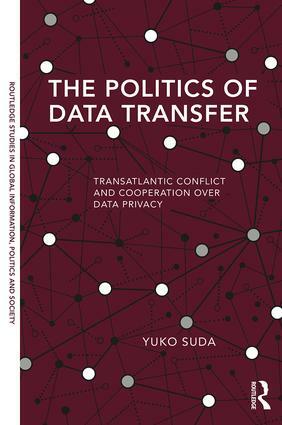 In this book, Yuko Suda examines the Safe Harbor debate, the passenger name record (PNR) dispute, and the Society for Worldwide Interbank Financial Transactions (SWIFT) affair to understand the transfer of personal data from the European Union (EU) to the United States. She argues that the Safe Harbor, PNR, and SWIFT agreements were made to mitigate the potentially negative effects that may arise from the beyond-the-border reach of EU data protection rules or US counterterrorism regulation. A close examination of these high-profile cases would reveal how beyond-the-border reach of one jurisdiction’s regulation might affect another jurisdiction’s policy and what responses the affected jurisdiction possibly makes to manage the effects of such extraterritorial regulation. The Politics of Data Transfer adds another dimension to the study of transatlantic data conflicts by assuming that the cases exemplify not only the politics of data privacy but also the politics of extraterritorial regulation. A welcome and timely collection uncovering the evolution of and prospects for the politics of data privacy in the digitalized and interconnected world. Yuko Suda is a part-time lecturer at Tokyo University of Foreign Studies, Japan.